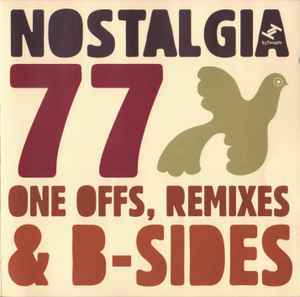 Nostalgia 77 continues to excel at downtempo bliss, and on his ONE OFFS, REMIXES & B-SIDES compilation, he shows off his skills in the past. Listen to the light, dreamy jazz of "Quiet Dawn (Examples Of Twelves Remix)" or the drifting horns of the instrumental "Little Steps." He strips down the jazz for his take of on Kinny & Horne's "Forgetting to Remember" or the pure soul of The New Mastersounds' "Your Love is Mine." He also engages in some remix exchanges with some of his downtempo compatriots: he plays up the jittery strings in the intro to TM Juke's "Knee Deep" and gets the favor returned when they warm up his "Conventical" with some funk. (Of course, he's perfectly capable of his own funk, as on "Sad Thing.") He gives Bonobo's "In Between the Lines" a twitchy, jazz, and Bonobo gives his "Quiet Dawn" some deep breaks. Povo puts a jazz-house stomp into "Wildflower," whereas Grant Phabao dubs up "Seven Nation Army" even further. The second disc focuses on the Nostalgia 77 Octet, a full-on jazz combo, which produces the jams ("Nativeland") with the best of them. But they can also cool things down, as with the longer, morphing "Desert Fairy Princess" or the groovy "The Moon." "The Grass Harp" has a hint of the Orient to it while shifting into some Vince Guaraldi-like keys. The final track, "The Impossible Equation," starts with a swirl of squeals and squelches, but grows and grows over its 20+ minute run time. A strong showing for Nostalgia 77.